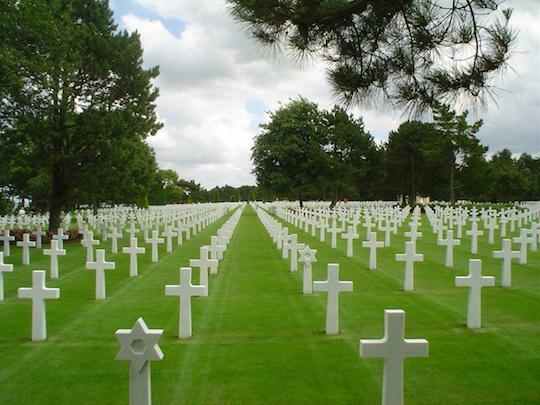 It is Memorial Day weekend… when we pause to honor the nation’s war dead. Most Americans will not, of course. It is merely a chance to lie flat on a beach… to munch frankfurters… to dream the dreams of approaching summer. We’ll be joining them of course. 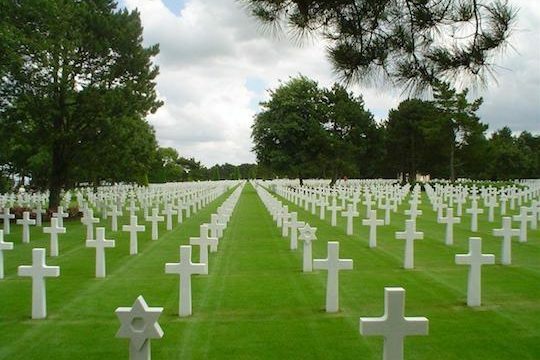 We will not be planting tiny American flags atop forgotten graves this weekend. We will not be bugling taps. It is unlikely we will thank a veteran for his service — not because we lack respect — but because we scarcely know any. 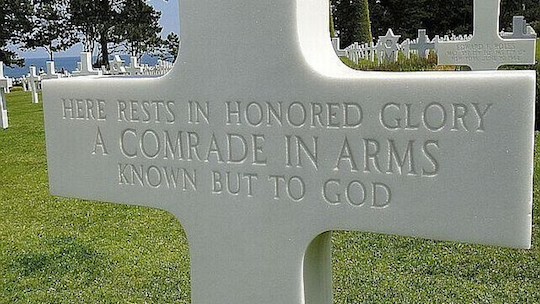 But we remember how we were brought up short one day… strolling the American military cemetery above Omaha Beach. The rows and rows and rows of bleach-white crosses — and an occasional Star of David — seeming to stretch from horizon to horizon. A haunting poem from the First World War came to us as we wandered among the dead… and listened for their ghostly counsel. “In Flanders Fields,” the poem was called. What fetched us was not so much the gravity of those distant events — but the soul-numbing waste of it all. What great things may have awaited that 21-year-old second lieutenant if a German bullet hadn’t cut him down on June 6, 1944? What did life have in store for that sergeant of the 2nd Ranger Battalion… who never made it up Pointe du Hoc? What about this young paratrooper of the 101st Airborne Division, whose bones lie beneath a shady tree? What might he have amounted to? But he had a life to live. And every right to live it. Let us also not neglect the pulverized and unidentified dead, known only to their creator. What about the futures they never had? Let us lower our heads in mournful reflection of America’s martial departed… and of what might have been.